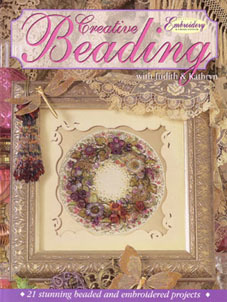 Creative beading with Judith and Kathryn features 21 all new beaded and embroidered projects. The book is suited to all levels of ability and even includes a simple stitching guide. If you are looking for a shop in your area that carries Judith and Kathryn products then there is also an extensive national and international stockists included. We love to hear your feedback on our work if you would like you can contact us with your thoughts, ideas and inspirations by sending us a email. "A touch of nostalgia and the charm of yesteryear are lovingly presented here for your enjoyment. Combining the techniques of beading, threadwork and silk ribbon embroidery, these pieces are reminiscent of a bygone era, when everyday objects like dolls and handbags were finely created with attention to every delicate detail. Lose yourself in the tranquility of our gardens, filled with gentle flowers and twining tendrils and the mellow warmth of beads and crystals. Allow your imagination to create elegant ladies clothed in glamorous gowns and finery, and embellish a rich array of cushions and a precious box for treasured collection. We have included wonderful projects for all levels of skill and for every taste, from the femininity of the Victorian era and the merging and flowing rhythms of Art Nouveau, to the charm of formal gardens and a rustic country house. Let your imagination carry you away down the winding, gentle paths of the past."